IC Insights is in the process of completing its forecast and analysis of the IC industry and will present its new findings in The McClean Report 2019, which will be published later this month. Among the semiconductor industry data included in the new 400+ page report is an analysis of semiconductor merger and acquisition agreements. The historic flood of merger and acquisition agreements that swept through the semiconductor industry in 2015 and 2016 slowed significantly in 2017 and then eased back further in 2018, but the total value of M&A deals reached in the last year was still nearly more than twice the annual average during the first half of this decade. Acquisition agreements reached in 2018 for semiconductor companies, business units, product lines, and related assets had a combined value of $23.2 billion compared to $28.1 billion in 2017, based on data compiled by IC Insights. The values of M&A deals struck in these years were significantly less than the record-high $107.3 billion set in 2015 (Figure 1). The original 2016 M&A total of $100.4 billion was lowered by $41.1 billion to $59.3 billion because several major acquisition agreements were not completed, including the largest proposed deal ever in semiconductor history—Qualcomm’s planned purchase of NXP Semiconductor for $39 billion, which was raised to $44 billion before being canceled in July 2018. 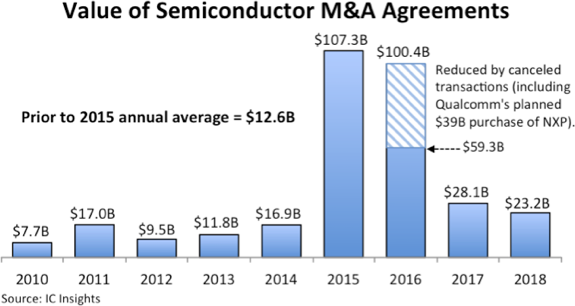 Prior to the explosion of semiconductor acquisitions that erupted four years ago, M&A agreements in the chip industry had a total annual average value of $12.6 billion in the 2010-2014 timeperiod. The two largest acquisition agreements in 2018 accounted for about 65% of the M&A total in the year. In March 2018, fabless mixed-signal IC and power discrete semiconductor supplier Microsemi agreed to be acquired by Microchip Technology for $8.35 billion in cash. Microchip said the purchase of Microsemi would boost its position in computing, communications, and wireless systems applications. The transaction was completed in May 2018. Fabless mixed-signal IC supplier Integrated Device Technology (IDT) agreed in September 2018 to be purchased by Renesas Electronics for $6.7 billion in cash. Renesas believes the IDT acquisition will strengthen its position in automotive ICs for advanced driver-assistance systems and autonomous vehicles. The IDT purchase is expected to be completed by June 2019. Just two other semiconductor acquisition announcements in 2018 had values of more than $1 billion. In October 2018, memory maker Micron Technology said it would exercise an option to acquire full ownership of its IM Flash Technology joint venture from Intel for about $1.5 billion in cash. Micron has started the process of buying Intel’s non-controlling interest in the non-volatile memory manufacturing and development joint venture, located in Lehi, Utah. The transaction is expected to be completed in 2H19. In September 2018, China’s largest contract manufacturer of smartphones, Wingtech Technology, began acquiring shares of Nexperia, a Dutch-based supplier of standard logic and discrete semiconductors that was spun out of NXP in 2017 with the financial backing of Chinese investors. Wingtech launched two rounds of share purchases from the Chinese owners of Nexperia with a combined value of nearly $3.8 billion. The company hopes to take majority ownership of Nexperia (about 76% of the shares) in 2019. Additional information on semiconductor mergers and acquisitions is included in the 2019 edition of The McClean Report—A Complete Analysis and Forecast of the Integrated Circuit Industry, which will be released in January 2019. A subscription to The McClean Report includes free monthly updates from March through November (including a 200+ page Mid-Year Update), and free access to subscriber-only webinars throughout the year. An individual user license to the 2019 edition of The McClean Report is priced at $4,990 and includes an Internet access password. A multi-user worldwide corporate license is available for $7,990. As part of your 2019 subscription, you are entitled to free attendance at a McClean Report half-day seminar (one seat for each copy purchased; company-wide licensees receive five free seats). The schedule for this year’s McClean Report seminar tour is shown below.